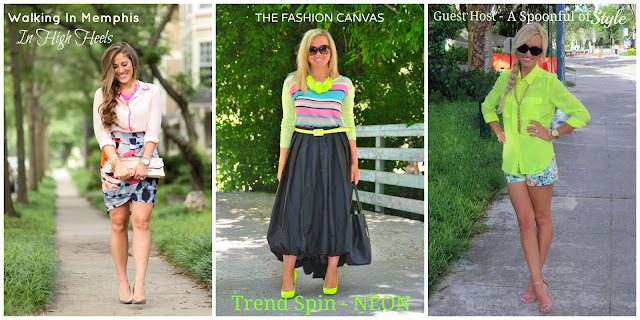 Today I have joined Laura from Walking in Memphis in High Heels and Erin from The Fashion Canvas, to co-host their trend linkup! This week was neon, currently one of my favorite trends! So here is how you can join in! Non-bloggers submit your photos to Trendspinlinkup@gmail.com. They will select one photo each to be there feature reader of the week on the day of the linkup (every Tuesday). Bloggers: All bloggers will be able to submit their posts link via the inlinkz widget below every Tuesday at 12:00 am with your take on the trend. This allows bloggers to show off their personal style, find new followers and meet other bloggers! For all bloggers we simply ask please follow your 2 hosts Walking in Memphis in High Heels, The Fashion Canvas and me, the co-host A Spoonful of Style (the first 3 links in the linkup) and provide a link to the Trend Spin Linkup in your post. You look great! I agree with Annie, the neon + floral shorts combo is great. How cute is this look! Love those floral shorts! Loving your neon blouse! It looks so cute with those shorts. perfect for summer! Love the bright neon shirt!! It went fabulously with this theme! I absolutely love this entire outfit. I have a similar top and heels like that. You look gorgeous. Thanks so much for cohosting! I love the neon! Bright colors are perfect for the summer! This is so pretty...I love me a good neon top! I just bought a Mini MAC too! In "Bubblegum", it's amazing! You can see pictures of my shooting on Hyams Beach (one of Australias whitest beaches) on my blog. Oh and one post before the Mini MAC one I blogged about the beaded rose necklace from J Crew and linked back to your blog, I hope you don't mind.